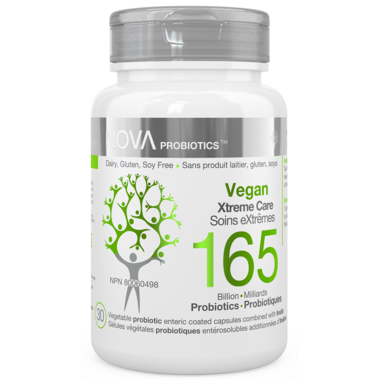 The NOVA Probiotics VEGAN Xtreme Care formula has been specially developed to improve the quality of life of patients suffering from gastrointestinal diseases and disorders. Disruption of the gut microbiome, termed dysbiosis, has been linked to numerous diseases including inflammatory bowel disease (IBD) such as Crohn’s disease and Ulcerative colitis, irritable bowel syndrome (IBS), Coeliac disease, allergies, asthma, ADHD, autism, and wider systemic manifestations of disease such as obesity, type 2 diabetes, and atopy. With high levels of actives cultures from 4 lactobacillus strains, the VEGAN Xtreme Care works to help restore the healthy composition and function of the gut microbiome. Directions: Take 1 capsule daily with a meal or as recommended by a therapist.